TT: What’s In A Beer? Welcome to the Thursday Tangent. If you’re looking for the Wednesday Wandering, just page back to offer your opinion on how much you read in a book before putting it aside. Or join me and Alan as we finally get around to discussing beer. until I got together with Jim, I just figured ale and beer were two different words for the same drink – regionalisms, so to speak. Is this the case, or is there a “real” difference? ALAN: These days there is no real difference and the terms are used interchangeably. Only an extreme pedant would insist that they were two different drinks. Originally ales were simply fermented grain products which did not include hops, and beers were fermented grain products which did include hops. But you can see how far we have come from that original distinction when I tell you that India Pale Ale is one of the hoppiest drinks imaginable! The hops give the beer its distinctive bitter taste and also act as a preservative. India Pale Ale was originally brewed for the British troops in India and so it had to survive a long sea voyage and still be drinkable at the other end. So it is very, very (say “very” a few more times) hoppy indeed. JANE: At least I can be “hoppy” that I have a reason for having been confused! ALAN: Bock is a very strong lager that was originally brewed in Germany. Despite being a lager, some of the bock brews are quite dark. The triple-bock is very strong indeed. They partially freeze the beer and remove the water ice, leaving the concentrated alcohol and grain extracts behind. It’s called freeze distillation, and it can give quite interesting tastes and textures to the final drink. That would account for the port-like smell and taste that you noticed. JANE: Ah! I’ve heard of that technique, but for making a brandy-like drink from wine. I encountered it first in a novel where the author clearly wanted strong drink, but at a technological level where distilling was impractical. ALAN: I’m interested to hear that Sam Adams brewed it. I drank some Sam Adams beer when I visited America many years ago and I was very impressed with it. American beers have a poor reputation in the rest of the world. They are thought of as weak, watery and tasteless. The SF commentator Dave Langford once remarked that you can get a hangover from drinking American beer, but you don’t have the pleasure of getting drunk first. However I found the Sam Adams brews to be extremely palatable. Are there any other American beers of a similar standard? JANE: I can’t name specific brewers – but I bet some of those reading this can. I do know that what are being called “artisanal” or “craft” beers (all you American beer drinkers, please feel free to correct me if I have missed a subtle difference between these two) are becoming quite popular. Now, as I’ve said, I’m a non-drinker, but I will taste something if people are saying it is interesting. Beer usually disappoints me. To me it smells wonderful, but tastes like stomach upset. However, a few weeks ago, I tried a craft beer from a place up near Taos that was the first beer I thought I could drink. I know there’s a trend here toward beers that are include odd ingredients. Just the other day, I read about a beer that included cherries, another that included hibiscus flowers… I’d be curious whether the trend towards odd ingredients in beer is common “over there” and, if so, what you think of it. ALAN: Using odd ingredients is very much an old brewing tradition, particularly in the Trappist monasteries of Belgium and Holland. Trappist monks aren’t allowed to do very much at all, they can’t even talk to each other! So to keep themselves occupied they have spent several hundred years perfecting the art of brewing some amazing beers. I once had a Trappist brew made with so many cherries that the foam on the top was bright pink! That was a very surreal experience. It was also, at least in my opinion, an extraordinarily disgusting drink. But then I don’t really care for cherries all that much. JANE: When we were talking about how a good writer of alternate history remembers the subtle changes, you said something about lager. What is it that distinguishes a lager from other types of beer? Why would it have taken the Germans to bring it into England? ALAN: Lagers are made with a yeast that sits at the bottom of the fermenting vessel and grumbles away slowly to itself. Other beers, particularly those brewed in the UK, use a different yeast that forms a foaming crust on the top of the fermenting liquid. The yeast used in bottom fermented beers works best at lower temperatures than the yeast used in top fermented beers. The final result also tastes better if served chilled whereas the top fermented beers taste better when served at room temperature. JANE: Wow! Obviously brewing beer is much more technical than I ever imagined. How many different kinds of beer are there in the world? ALAN: There are probably as many different kinds of beer as there are different kinds of wine, and for much the same reason. We recently had a beer festival here in Wellington. It was called Beervana, and it had 212 distinctly different beers available for tasting, almost all of which were brewed here in New Zealand. And that’s just one small country! Imagine the range of beers available in Europe where they’ve been brewing the stuff for hundreds, if not thousands of years! JANE: Did you taste all 212 beers? ALAN: No – I only managed about 10 of them before I had to (reluctantly) give up. But each was distinctive, each had its own flavour and texture. And of course, being a beer festival, Beervana was also full of beer snobs talking learnedly about aftertastes, chocolate flavours on the palate and crispy smoothness. Beer snobs are just as bad as wine snobs. Have I ever told you about CAMRA, the Campaign for Real Ale? JANE: No, you haven’t. How about next time? This entry was posted on October 13, 2011 at 1:00 am and is filed under Thursday Tangents. You can follow any responses to this entry through the RSS 2.0 feed. You can leave a response, or trackback from your own site. Weak, watery, and tasteless? You mean like Fosters? Tsing tao makes even Budweiser taste watery. You’re right though. Many of the mass market beers, regardless of origin, are best used for boiling bratwurst. That’s not true for most of the small breweries, and there are a lot of those. My current favorite (Dogfish Head Midas Touch) has an alcohol content of about 9%. 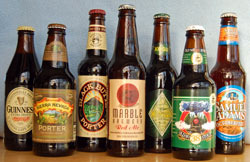 Admittedly it’s not strictly a beer, but there are beers around the US which get into this range. Often they’re called barley wines. As for the flavor, my partner prefers either ciders or fruity beers like framboise. She takes no pleasure in bitterness, and hops are certainly quite bitter. Personally, I like hops, but to each their own. The description of American beers might’ve been true years ago, but nowadays, there is so much variety that it no longer holds water. I suspect that the (heavy?) use of rice in the major American labels is the source of the criticism. In addition, these beers were meant to be drunk *very* cold: they don’t taste nearly as good when near room temperature. My current favorite is a milk stout available at a nearby restaurant (which we seldom can go to), but there are so many good ones. Even the “mass market” beers have their place: nothing is better during a hot day working in the sun than an ice-cold Lone Star or other such type. My wife’s taste in beers is closer to Jane’s or heteromeles’ friend: she does not like hoppiness, but likes many of the fruity beers and ciders.